Raising animals can be a fun family project, but what are the 6 easiest cows to raise with your children? Caring for cows teaches young children about responsibility and brings the food cycle out from under layers of supermarket packaging. Children will witness and participate in the hands-on work of food production, which will teach them to value food as a process and a resource instead of a faraway commodity. And, of course, raising a cow improves the quality of your family’s food supply. 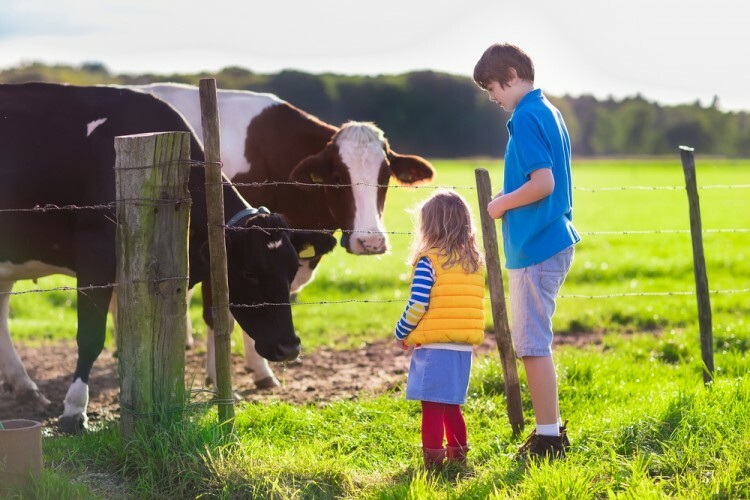 There are clear benefits to raising a cow with your children, but there are also important questions to ask when choosing the best breed for you. Will your cow provide dairy or beef? There are only a few breeds which provide both. Dairy cows tend to turn their feed into milk, while beef cattle turn their feed into muscle bulk. We’ve included both in our list to offer your family the best choices. Who knows — maybe you belong in the 10 largest cattle producing states in the US and you don’t even know it. In order to give you the best recommendations, we’ve considered several areas. To choose the “easiest,” we judged their hardiness, expected lifespan, and grazing efficiency. We’ve also included information on how easy they are to breed since this is valuable to many. But most importantly, these cows need to have calm, reliable personalities to be child-friendly. We’ve combined these different factors into one definitive list.